Before we redesigned the beaver tail they were just an afterthought to the gun. 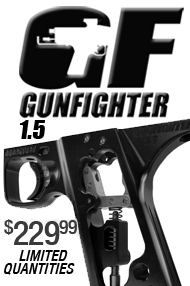 Stamped aluminum, matte black finish, a sorry back end to an otherwise great gun. Now however our beaver tail brings the whole pacakge together. Sleek stainless steel bent rod with an aluminum screw mount fitting to the gun and a matching ring to prevent you from doing bad things.